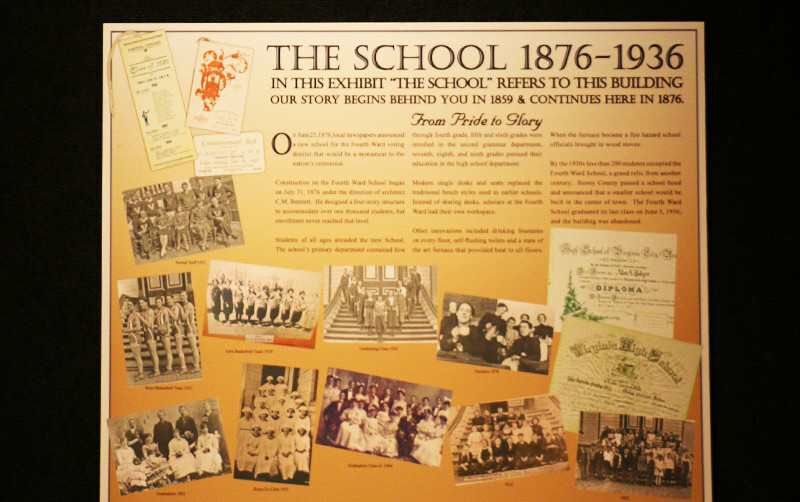 Permanent exhibits include the Fourth Ward School building, a historical overview of the Comstock, a Comstock mining overview including an interactive modern mining program funded by the Commission of Mineral Resources, abandoned mine issues, an original 1870’s classroom, Virginia City Alumni photographs and memorabilia, timeline of Mark Twain, letter press printing and Sagebrush journalists and type slingers. A new exhibit is featured each season. 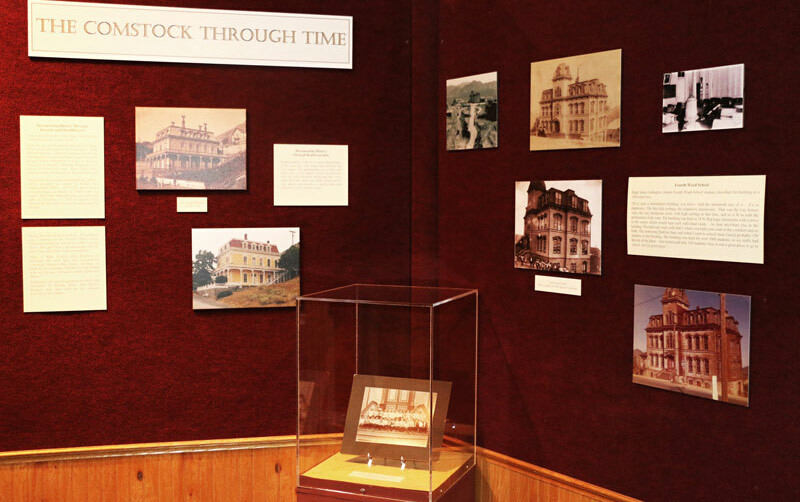 The Comstock Through Time highlights specific themes in the history of the Comstock through photographs and personal accounts. Then and now photographs, also known as rephotography help to emphasize the changes in the community and surrounding area. Books, journal entries and oral histories gives the visitor a first hand account of daily life, revealing vivid details and descriptions of the sometimes chaotic life on the Comstock. “The First Ward School accommodated the first through third grades. Mrs. Quirk was a beautiful little lady – very prompt, petite and a great teacher… The first day of school she would pull out this razor strap that looked about five feet long and give us a little lecture on discipline. Then she would put the strap away in her desk, and we never saw it again for the rest of the year.”– William Marks, UNR Oral History interview, 1984. 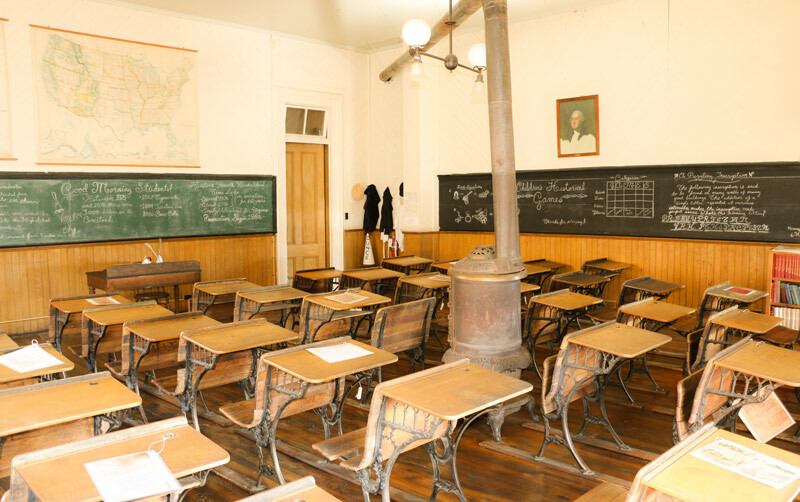 Step back in time in our original 1876 classroom. 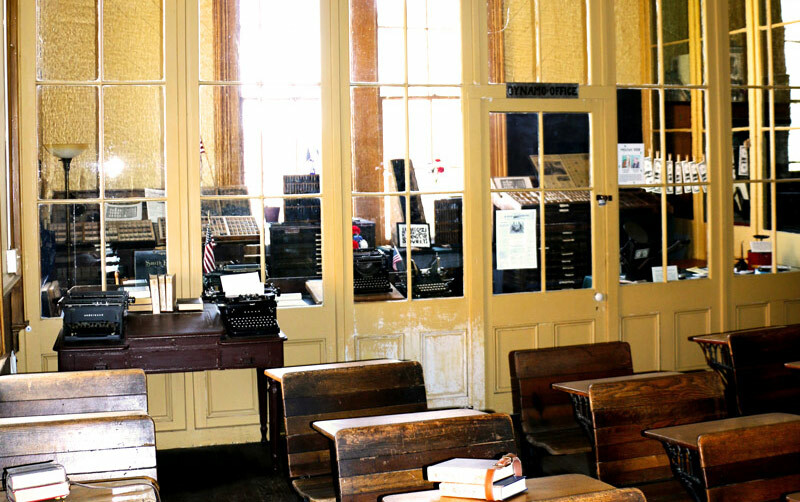 A School Day is real here with original desks, wall maps, pot-bellied stove and even an organ. Look down and you can even see the wear of small shoes on the wooden floor. Learn more about the discovery of the Comstock Lode, the fascinating people and technologic innovations that made it possible. See class photographs dating from 1883 to 1964. Read about the teachers, students, and the long tradition of basketball in Virginia City. “Gee, it was a great place to go to school. Just a great place,”-Hugh Gallagher, former Fourth Ward School student. This room houses a restored 1887 Chandler and Price printing press and a permanent Mark Twain exhibit. You’ll also see a glass-enclosed, artifact laden space that served to separate typing lessons from the rest of the classroom. Virginia City mining inspired a flurry of technical innovations, and many are on display here. Did you know that San Francisco cable cars owe their smooth running to a Virginia City invention? 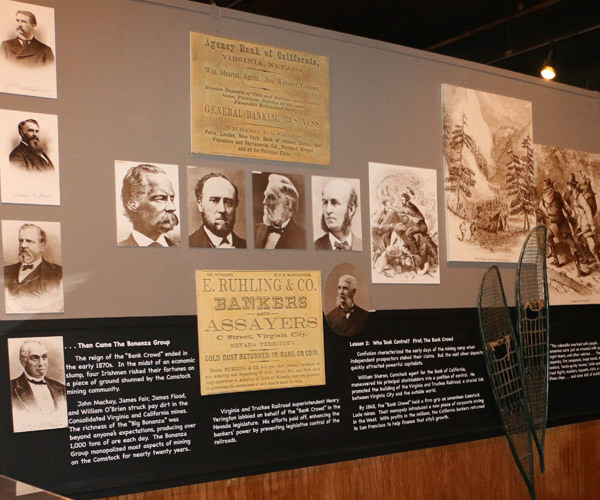 The room contains an exhibit that tells the story of Comstock mining.